5790, 87020-900, Maringá PR Brasil. Phone 0055 44 2614679. The participation of the recently described uvsZ1 mutation in checkpoint control and the identification of epistatic relations between uvsZ1 mutation and uvsD153 and uvsJ1 mutations are provided. The effect of mutation uvsZ1 in mitotic exchanges into paba-bi (chromosome I) and cho-nic (chromosome VII) genetic intervals has also been evaluated. The mutation uvsZ1 was epistatic with regard to uvsD153 and uvsJ1 mutations, with no involvement with checkpoint control. In contrast to mutations in UvsB and UvsF groups, the uvsZ1 mutation failed to cause any changes in the frequencies of mitotic crossing-over. The distinct phenotypic traits given by mutation uvsZ1 suggest the presence of complex interactions among the different DNA repair pathways. Interaction may be an additional cell strategy of DNA damage response. Key terms: Aspergillus nidulans, checkpoint pathways, DNA repair, uvs mutations. DNA damage response is mediated by mechanisms that maintain genome integrity. It functions through DNA repair pathways that act directly in genotoxic lesions and checkpoint systems that promote cell cycle arrest in the presence of DNA lesions. The above mechanisms have been extensively studied in many organisms, mainly after the correlation between genes involved with DNA damage response and cancer (Fishel and Kolodner, 1995; Goldman et al., 2002). The uvs genes, related to DNA repair and checkpoint systems in the filamentous fungus Aspergillus nidulans, have been identified and classified in different epistatic groups (Kafer and Mayor, 1986; Kafer and May, 1998; Goldman et al., 2002). Mutations of UvsC epistatic group (uvsA, uvsC and uvsE genes) display phenotypes consistent with defects in recombination-mediated repair: changes in homologous recombination frequencies and sensitivity to agents that cause double strand breaks (DSBs). Consequently, UVSC is homologous to RECA of Escherichia coli and to RAD51 of Saccharomyces cerevisae, needed in the post-replicational repair pathway (van Heemst et al., 1997; Han et al., 1998). The uvsl gene, the sole representative of group Uvsl, is involved in error prone repair. UVSl is homologous to REV3 of S. cerevisiae, the catalytic sub-unit of Zeta polymerase (a mutagenic bypass DNA polymerase) (Han et al., 1998). Mutations on uvsF, uvsH and uvsJ genes (UvsF) display phenotypes related with defects in the nucleotide excision repair (NER), an increase of mitotic recombination frequencies and UV-induced mutagenesis. However, the molecular characteristics of proteins UVSF (homologous to the large sub-unit of replication factor C) (Kafer and May, 1997), UVSH (homologous to RAD18 of S. cerevisiae) (Yoon et al., 1995) and UVSJ (homologous to RAD6 of S. cerevisiae) (Jang et al., 2001) indicate involvement of group UvsF with error-free post-replicational repair. Although they were originally related to NER, uvsB and uvsD genes (UvsB) are involved with checkpoint control in response to lesions and incomplete DNA replication. uvsB and uvsD mutants show premature mitosis and intensive DNA replication in low concentrations of hydroxyurea (HU). The UVSB protein belongs to the conserved family of ATM-related kinases and UVSD protein is homologous to RAD26 of S. pombe. Both are involved with the regulation of DNA damage response (De Souza et al., 1999; Hofmann and Harris, 2000). The recently described uvsZ1 mutation displays NER phenotype and is epistatic with uvsB413 and uvsH77 mutations, which belong to distinct epistatic groups (UvsB and UvsF respectively) (Baptista and Castro-Prado, 2001). Current research verifies the participation of mutation uvsZ1 in checkpoint systems and identifies epistatic relationships between uvsZ1 and other mutations belonging to UvsB and UvsF epistatic groups. 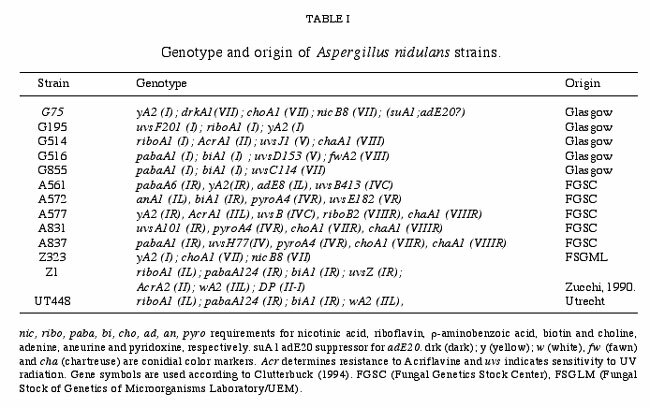 A. nidulans strains used are described in Table I. Complete medium (CM) and minimal medium (MM) were described previously (Pontecorvo et al., 1953); selective medium (SM) was MM supplemented according to requirements for each strain. Compact colonies were obtained in SM plus Triton X-100 (0.01%) (TSM). Solid medium contained 1.5 % agar. Incubation occurred at 37oC. HU was obtained from Sigma Co. The following general methodologies were obtained from a previous paper (Van de Vate and Jansen, 1978). Diploid strains were prepared by the Roper method (1952). Heterokaryons were prepared in liquid MM plus 2.0% CM. Cleistothecia were obtained from heterokaryons after 21 days of incubation in sealed plates containing SM. Distinct uvs mutants were combined into heterozygous crosses to obtain double uvs mutant strains. Non-dividing cells were tested for UV sensitivity, as previously described (Baptista and Castro-Prado, 2001). The UV dose rate reached 1.4 ergs.sec-1. Results represent mean ± SEM of 4 experiments carried out in dark or red light to exclude photoreactivation. HU sensitivities were measured according De Souza et al. (1999). The effect of uvsZ1 mutation in mitotic exchanges into paba-bi (chromosome I) and cho-nic (chromosome VII) genetic intervals, was evaluated by UT448//G75 (uvs+//uvs+), G75//Z1 (uvs+//uvsZ1) and Z1//Z323 (uvsZ1//uvsZ1) crosses. The procedures to measure mitotic recombination followed Costa et al. (2001) and Franzoni and Castro-Prado (2000). Frequencies of meiotic recombination were then determined in percentage (FR= total number of recombinants x 100/total number of meiotic segregants to cho and nic genetic markers). Data were compared by contingency Table 2 x 2 (Yates corrected x2) at p < 0.05. 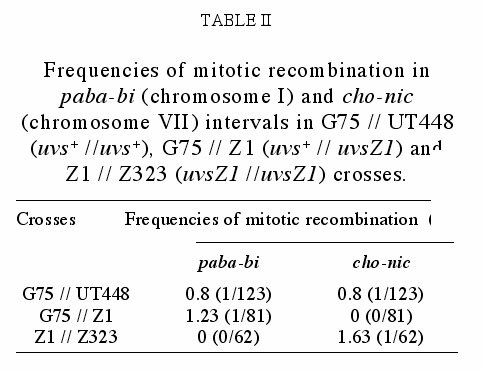 Analyses of mitotic recombination in heterozygous (G75//Z1) and homozygous (Z1//Z323) crosses for uvsZ1 mutation produced normal crossing-over frequencies in paba-bi interval of chromosome I and cho-nic interval of chromosome VII (Table II). Results suggest no involvement of uvsZ1 mutation with mitotic exchange events. 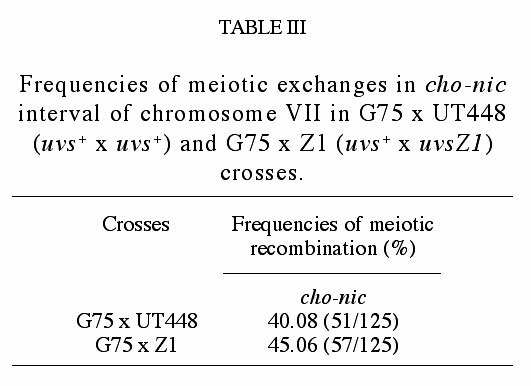 Sexual cross G75 x Z1 (uvs+ x uvsZ1) had normal meiotic recombination frequency between cho and nic markers (Table III). Analyses of meiotic crossing-over in homozygous crosses for mutation uvsZ1 were limited by infertility caused by the mutation's homozygosity. Interactions among uvs genes are epistatic when double mutants fail to show a higher sensitivity to a certain genotoxic agent, in comparison with their respective single mutants. Thus uvsD153 and uvsZ1 mutations and uvsJ1 and uvsZ1 mutations were combined in the same genome and double mutants were analyzed with regard to their UV sensitivity. uvsJ1;uvsZ1 and uvsD153; uvsZ1 double mutants were not more sensitive to UV light than uvsJ1 and uvsD153 single mutants respectively (Fig. 1a and b). Results show epistasis between uvsD153 and uvsZ1 and uvsJ1 and uvsZ1 mutations. This demonstrates that UVSZ is needed in different pathways of DNA damage responses. Previous studies have shown that uvsB and uvsD function in checkpoint systems. They act in checkpoint regulation and stop the cell cycle before the start of mitosis in response to slow-S phase and G2 DNA damage (De Souza et al., 1999). Due to epistasis between uvsD153 and uvsZ1 mutations (Fig. 1b), uvsZ mutants were analyzed with regard to hydroxyurea sensitivity, a DNA replication inhibitor agent. Z323 and Z1 mutants failed to show sensitivity to HU in any concentration (Fig. 2). Results indicate that, similar to UVSB and UVSD proteins, the UVSZ is required in DNA damage response. However, no involvement with the checkpoint systems was shown. Figure 1: Survival of single uvs mutant strains, compared to double mutants combining uvsZ mutation with (a) uvsJ1 mutation and (b) uvsD153 mutation. Studies in several organisms show that DNA damage response functions through many pathways that repair or tolerate DNA lesions (Goldman et al., 2002). Although most proteins involved in these pathways have highly conserved domains required for their essential functions, alternated use of these basic functional units may produce different mutant phenotypes and possibly differentiated repair pathways (Kafer and May, 1998). uvsZ1 mutation displayed epistasis with uvsB413 and uvsH77 (Baptista and Castro-Prado, 2001), and uvsD153 and uvsJ1 mutations (Fig. 2 a and b). These facts suggest the involvement of UVSZ in different stages of DNA damage response: post-replicational repair, related to UvsF group (Kafer and May, 1998) and control of DNA damage response, associated with UvsB group (De Souza et al., 1999; Hofmann and Harris, 2000). Contrastingly to uvsB413 and uvsD153 mutants, uvsZ1 mutants were not sensitive to HU (Fig. 2). Consequently, epistasis between uvsZ1, uvsB413 and uvsD153 mutants may be justified by uvsB and uvsD involvement with several processes of DNA damages response, such as regulation of gene expression, induced mutagenesis and checkpoint control. UVSZ may be required in some of these stages without any participation in the checkpoint control systems. In opposition to mutations of UvsB (uvsB and uvsD) and UvsF (uvsF, uvsH and uvsJ) groups, uvsZ1 mutation did not alter mitotic crossing-over frequencies. Results suggest that DNA lesions of uvsZ1 mutants may be repaired by other pathways, such as error-prone repair (Baptista and Castro-Prado, 2001), without any need for high frequencies of mitotic exchanges for DNA lesion tolerance. Homozygosis-caused infertility of uvsZ1 mutation has also been detected among uvsJ, uvsC and uvsE mutations, which are involved with post-replicational repair pathways (Lanier et al., 1968; Fourtuin, 1971). 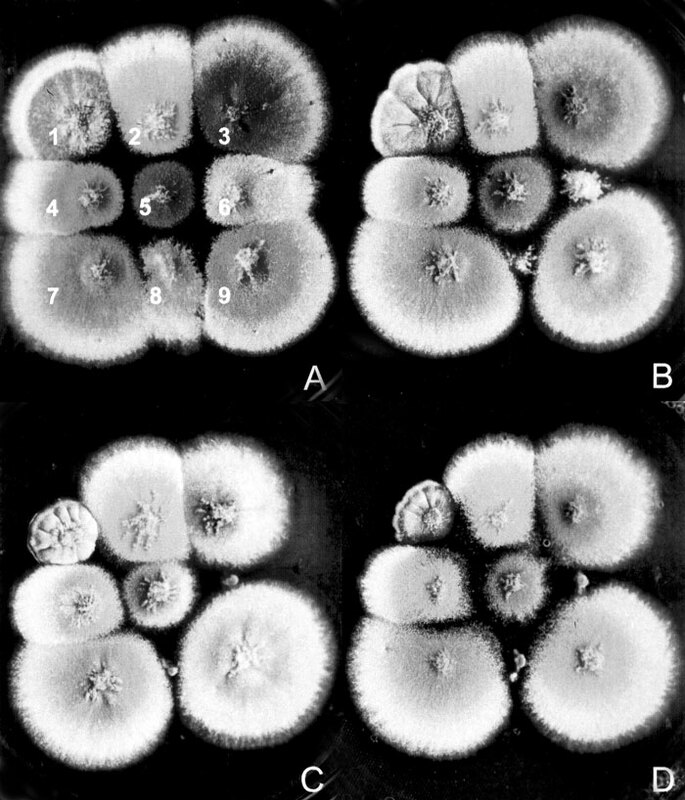 Similar to other fungi, recombination repair defective mutants in Aspergillus are either sterile or exhibit changes in the meiotic recombination frequency in homozygous crosses (Kafer and May, 1998). The above data coupled to epistasis between mutation uvsZ1 and UvsF group mutations corroborate the hypothesis on the involvement of mutation uvsZ1 with post-replicational repair pathway. uvsZ1 mutation of A. nidulans differs from other uvs mutations that have been described in this organism: it displays the NER phenotype, although it does not change the frequencies of mitotic recombination; inhibits sexual reproduction in homozygous crosses; it has epistasis with two distinct epistatic groups (UvsB and UvsF), although it does not influence regulation systems of the cell cycle, such as epistatic mutations of UvsB group. The multifunction trait and the unique phenotype caused by mutation uvsZ1 suggest that a complex web of enzyme interactions, rather than isolated repair pathways, make up the cell strategy of DNA damage response. Figure 2: HU sensibility after 48h of incubation. A: Control; B: 2mM HU; C: 4mM HU; D: 5mM HU. 1: Z1 (uvsZ1); 2: G195 (uvsF201); 3 A831 (uvsA1); 4: G514 (uvsJ1); 5: A572 (uvsE182); 6: A577 (uvsB413); 7: A837 (uvsH77); 8: G516 (uvsD153) and 9: G855 (uvsC114). We would like to thank CAPES (Nucleus for Upgrading University Personnel), CNPq (National Council for Scientific and Technological Development) and Foundation Araucária (Foundation for the Support of Research of the State of Paraná) for their support. Thanks are also due to Dr. Clutterbuck for sending us the G75, G195, G514, G516 and G855 strains and to Ms. Sônia Aparecida de Carvalho and Mrs. Luzia de Souza Regazzi for their technical assistance. Received: September 24, 20002. Accepted: October 2, 2002.